One of my favourite Northern Thai dishes is Nam Prik Num (น้ำพริกหนุ่ม). This is a popular chili paste dip, made from young chilies called prik num (Northern Thai dialect). The chilies are long and light green. 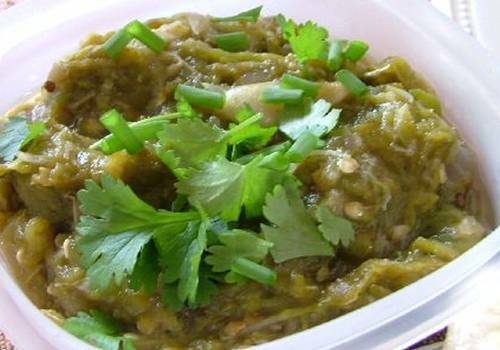 The chili paste is thick, moist and fibrous as a result of pounding together a mixture of roasted young chilies (or aubergines), shallots, garlics, garlic, coriander leaves, lime juice and fish sauce. Nam Prik Num is generally eaten with steamed and raw vegetables, and sticky rice. 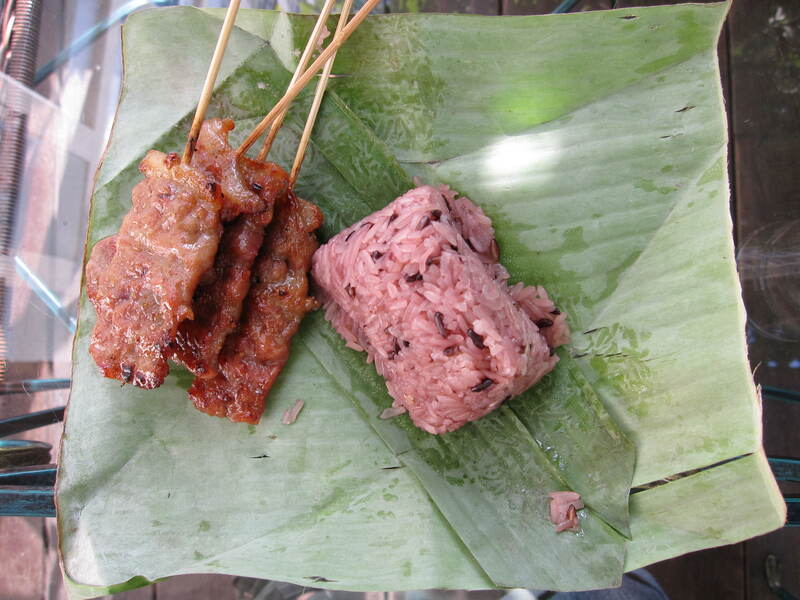 I like to eat it with sticky rice, muu ping (spicy grilled pork skewers) and fried eggs for breakfast. Nam Prik Num is hot, salty, and sweet due to its various ingredients. 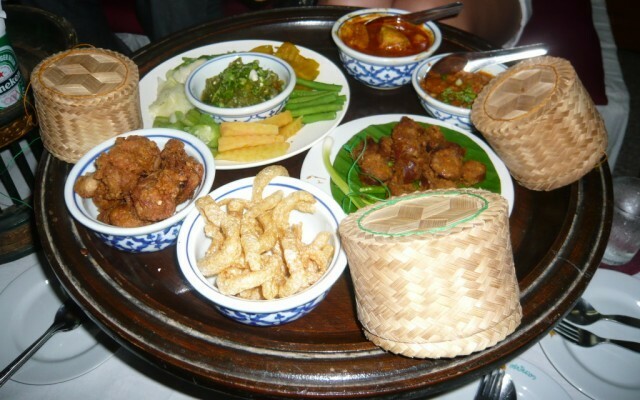 It is a component of any khan tok (typical Northern Thai food served on a khan tok table) dinner and is a favorite gift from the North and widely available in Bangkok. Roast the chilis, aubergine, garlic and shallots by wrapping them into tin foil packets. The foil will keep in the juices. Place the foil packets in a frying pan and fry until the vegetables are soft and cooked. Remove the skin and seeds from the peppers. Finely chop shallots, garlic and peppers, add the coriander leaves, fish sauce and lime juice until well combined in a mortar. This leaves you with a salsa that is slightly chunky and a little soupy. You can also put every thing into a food processor and it will give you a rather smooth salsa. Let stand at least 30 minutes before serving to let all of the flavours meld. Serve at room temperature with rice crackers, sticky rice, kap moo (Pork crackling), lightly steamed vegetables, sliced cucumber or lettuce leaves. 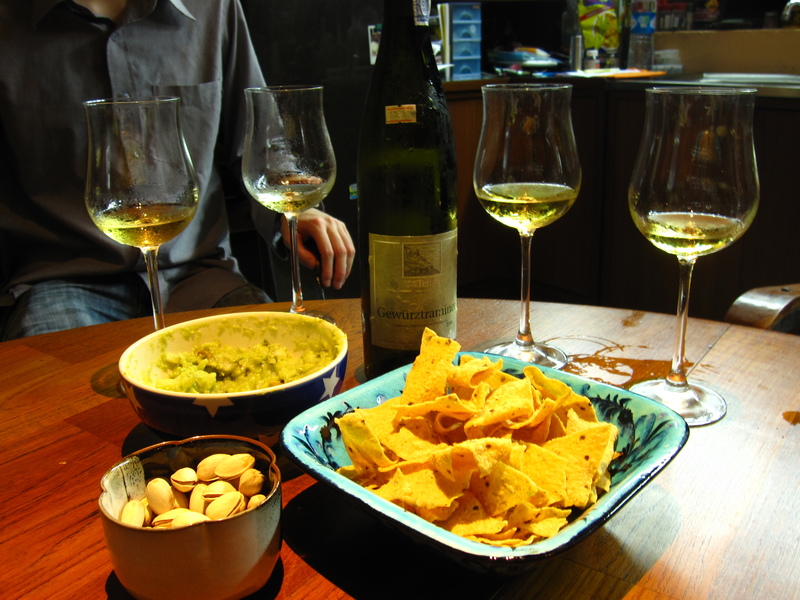 Another tasty variation to this recipe is to add fresh avocados with the Nam Prik Num to make a spicy version of guacamole! Diagonally slice the eggplant ¼ to ½ inch thick. Grill or broil the slices until golden brown on each side. Let them cool a bit, then chop coarsely and put in a large bowl. Add the shallots and herbs. In a separate bowl, combine the juice, sauce, sugar, and chili. Pour onto the eggplant and toss. Set aside for a half hour or more so the eggplant can absorb the seasonings. Serve the eggplant yam (Thai Salad) in a low bowl or on a plate accompanied by a plate of lettuce leaves (add thinly sliced vegetables if you like). Use the greens to scoop up a bite of yam. NOTE: I owe my love to Nam Prik Num to my dear friend Jick who introduced me to this addictive dish at her home in Chiang Mai 30 years ago! 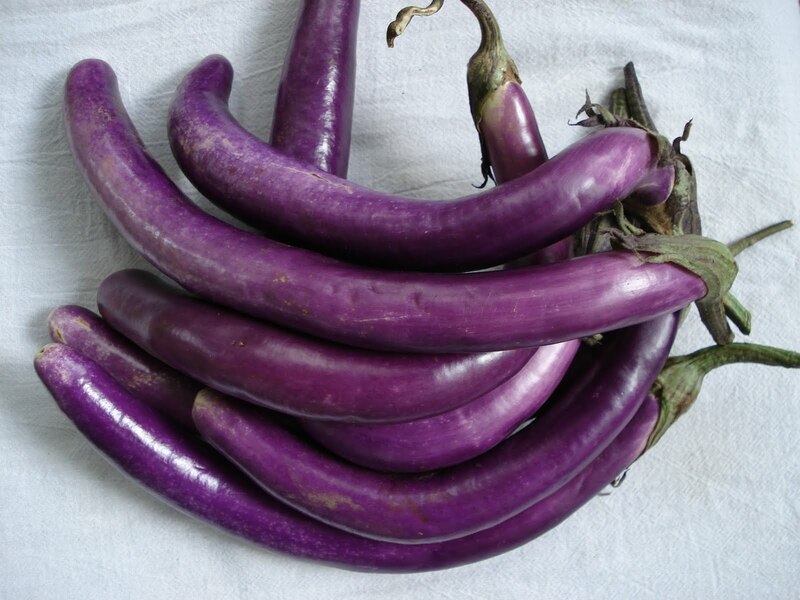 This entry was posted in Chiang Mai, Culture, Recipes, THAILAND and tagged aubergine, Aubergine Salsa, chili salsa, eggplant, Eggplant salad, Japanese aubergine, Nam prik, Nam prik num, Tapas, Thai aubergine, Thai Aubergine Salad, Thai eggplants, Thai food, Thai guacamole, Thai recipes, Thailand. Bookmark the permalink.